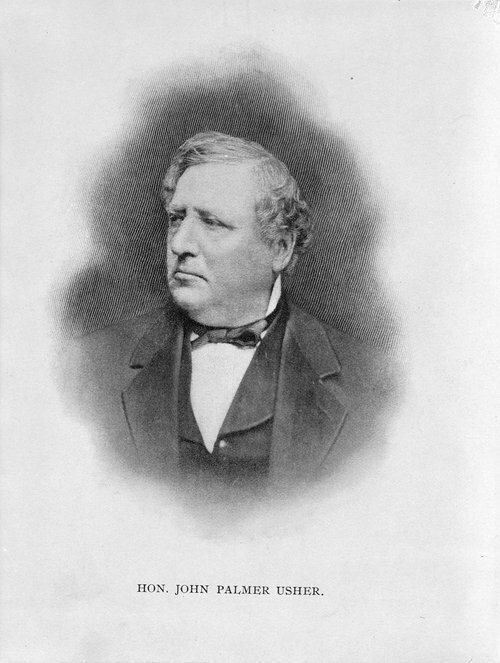 This black and white engraving shows John Palmer Usher, (1816-1889). A lawyer from Indiana and a member of President Abraham Lincoln's cabinet. Usher served only two years as the seventh U.S. Secretary of the Interior, (1863-1865), before returning to private life. In 1865, he become the chief counsel for the Kansas Pacific Railroad a position he held until his retirement in 1880. Usher also resumed his political career when he moved to Lawrence, Kansas, in 1872, and was elected to serve one term as the town's mayor (1879-1881). On April 13, 1889 at the age of seventy-three, he passed away at the University Hospital in Philadelphia after a lengthy illness. Burial was at the Oak Hill Cemetery in Lawrence, Kansas.